This night's tasting featured a varied selection of wines following a couple themes. 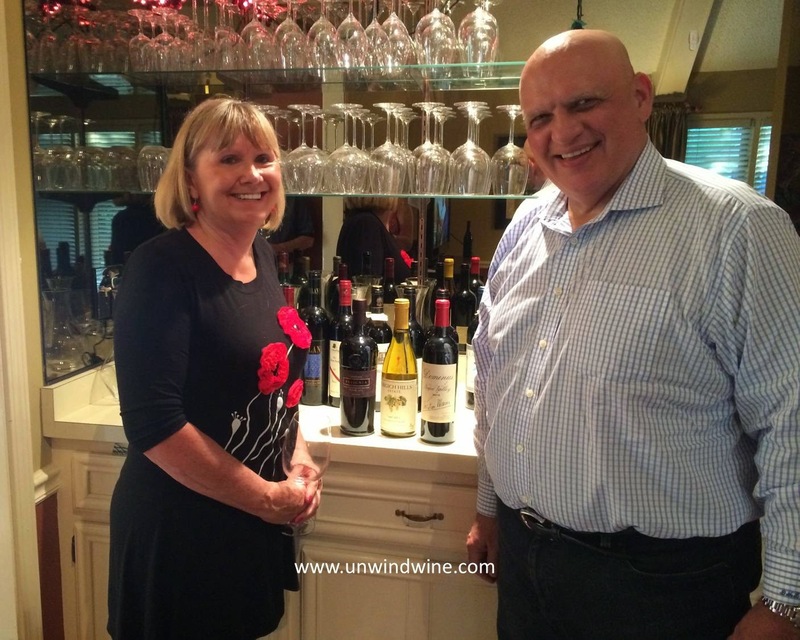 One commemorating this year being the 4th decade for Linda and me featured the four decade anniversary vintages of '74, '84, '94 and '04. The others reflected the spirit of OTBN, to bring whatever label was desired for drinking that night. 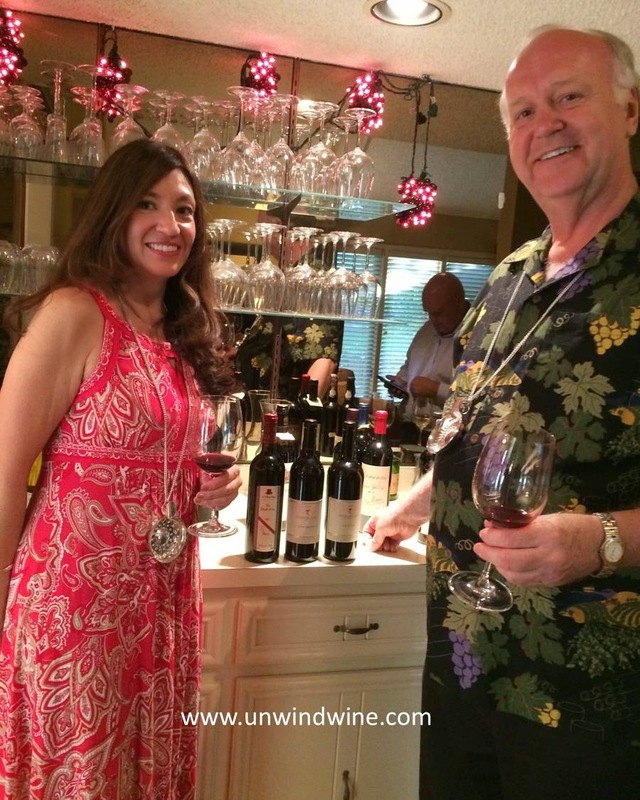 As is always the case, the occasion produced a great tasting event of fabulous and interesting wines, great wine and food pairings, fellowship, friendship and fun. 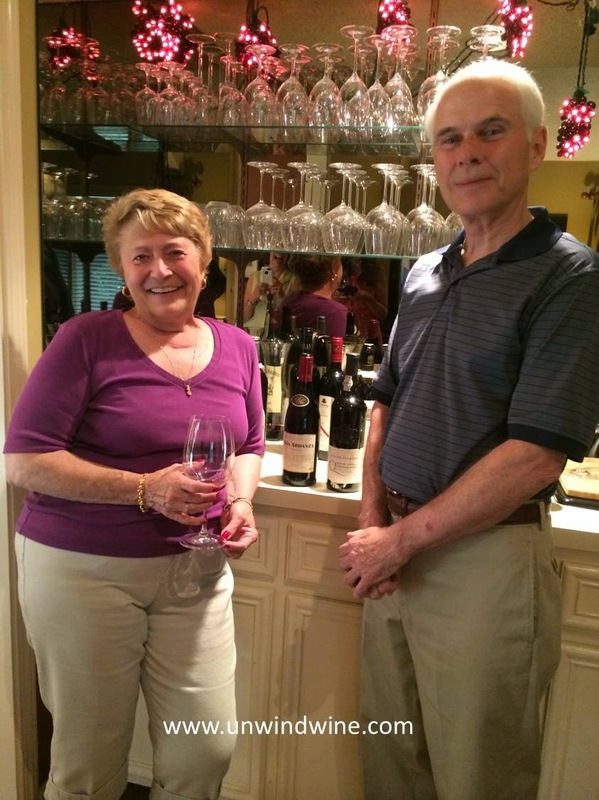 Bill and Beth hosted and prepared a great wine friendly dinner of beef tenderloin, duck breast, scalloped potatoes, haricot verts, green salad, caprese salad and a desert course. Before dinner there was a selection of artisan cheeses, and shrimp cocktail. A mixed green salad was accompanied by a cold tomato based soup. The OTBN (Open That Bottle Night) tradition calls for the event to occur the last Saturday night in February. This year's event was postponed twice, initially due to an outbreak of the flu and then for another conflict. So we declared tonight's tasting to effectively became our fourth OTBN in this column. See our 2011, 2012 and 2013 OTBN reports. 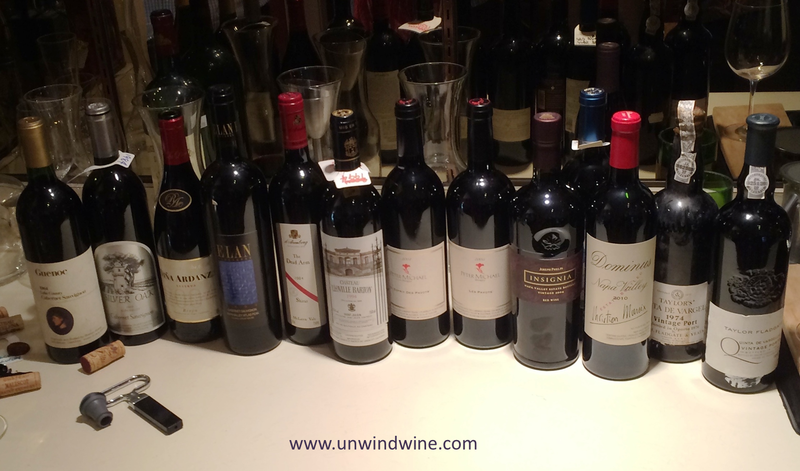 Every year since 2000, on the last Saturday night in February, Open That Bottle Night (OTBN) has been celebrated - the time to uncork and enjoy that cherished but here-to-for elusive bottle. 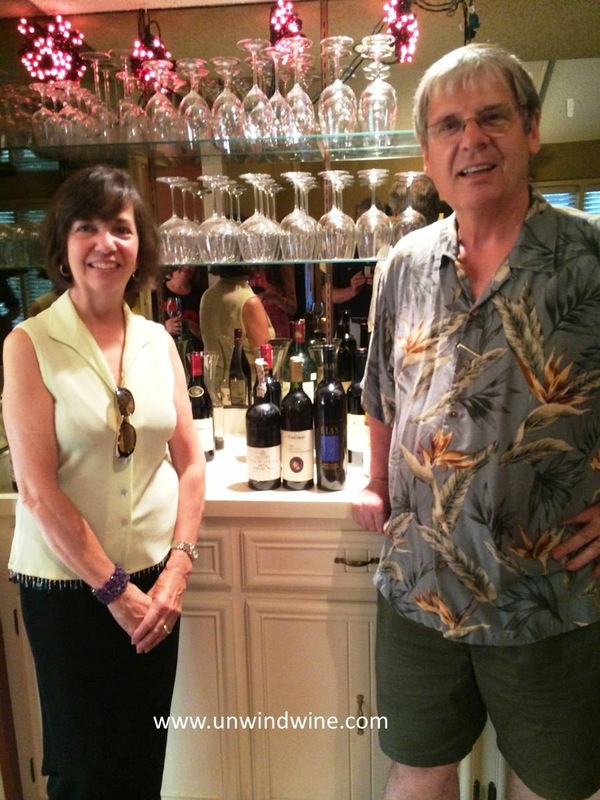 OTBN was conceived by Gaiter and Brecher to say, what the heck, go for it, Open That Bottle (to)Night. They realized they weren't alone - having that special bottle set aside for an occasion that just never happens. On this night, you don't need an excuse or a reason - just do it! Take advantage of OTBN to open that bottle and enjoy it! Enjoy it by yourself, or better yet, enjoy it with someone special, or even better, with a group of special friends. Have everyone bring such a bottle and let the story telling begin, because amazingly, every OTBN bottle has a story or some meaning, or not. What the heck, Open That Bottle (To) Night!. Let the fun begin. The ritual for all our tasting events starts with the 'lineup', the exercise of lining up the bottles in the planned order of tasting. This is a fun debate that by default conforms to the prescribed tasting conventions - starting with the lighter and simpler wines first since a heavier or heartier wine will overpower lesser wines and you'll lose all sense of discrimination or calibration for them. Once the initial tasting order is set, part of the fun is testing it to see if we got it right based on the actual tasting results. Most often we get it right with just a few tweeks along the way. Again on this night, this was the case. Before we ventured into the flight, Bill served a pair of chardonnays with the pre-meal shrimp and assorted cheeses - Sancerre 2012 and Chateau Montelena Napa Valley Chardonnay 2009. 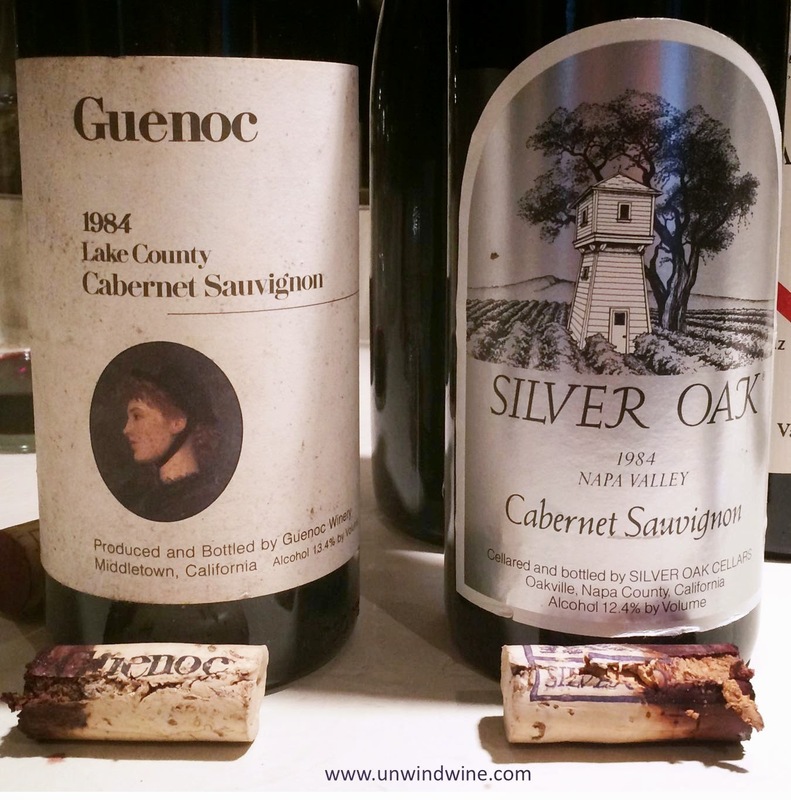 We started the red wine flight with two 1984 California Cabernet Sauvignons - Guenoc Lake County, and Silver Oak Napa Valley. The story behind this bottle goes back to a tasting that occurred in July 1998 when I served a large format six liter bottle of this wine to colleagues from around the world at a global country managers meeting. Colleague Pete F and I entertained the group and I hosted a special wine tasting featuring 16 different wines from their respective countries from my cellar. One of the highlights of the tasting culminated with the 6 liter bottle the label of which we all signed (left). My notes from that event - "What do you expect from a 14 year old Lake County Cab? What a pleasant surprise to find this one full of berry, plum, cherry and an earthy mocha chocolate. This was tasted from a six liter bottle which no doubt held the fruit." The story about tonight's bottle resulted from our visit to the winery in the early 90's seeking a bottle of 1984 from their library. They said there weren't any for sale. When I told them I was holding this 6 liter bottle in my cellar for a special occasion and I wanted some from that vintage to 'test' before serving, they kindly obliged with a couple bottles. This is the last remaining bottle from that purchase. Read more about large format bottles. I was prepared to dump this and move on to the next bottle, expecting that I had held onto this thirty year old for too long. Not to be as we were pleasantly surprised to find it was still holding was eminently drinkable, albeit with diminished color, structure and fruit being whispers of what they once were as noted above. Notice (above) the Silver Oak '84 bears the old historic 'silver' label that today is used only for the Alexander Valley release while Napa Valley is now adorned by an upscale painted bottle branding and packaging. As with the Guenoc above, this was still drinkable although it had diminished color and fruit. That Silver Oak signature oakiness still predominated and stood out over the subdued earthy berry and cedar leathery finish. From Bill's cellar. From a more modest Bordeaux vintage, this still showed classic left bank complexity of earthy leather and notes of cedar with smooth polished subdued blackberry fruit accent with a hint of anise on a nicely refined lingering tannin finish. Bill had open this magnum of this savory Bordeaux to start the evening. Dark garnet colored, medium bodied with huge floral perfume aromatics that typify the best of Margaux. They give way to pleasant, nicely balanced black raspberry and black currant fruits with tones of anise, expresso, and hints of spicy mocha on a leathery tobacco finish. Lyle brought this Tempranillo based Rioja Reserva. Garnet colored, medium bodied, black fruits give way to earthy, tobacco, spice, smoke and leather with a long balanced finish. 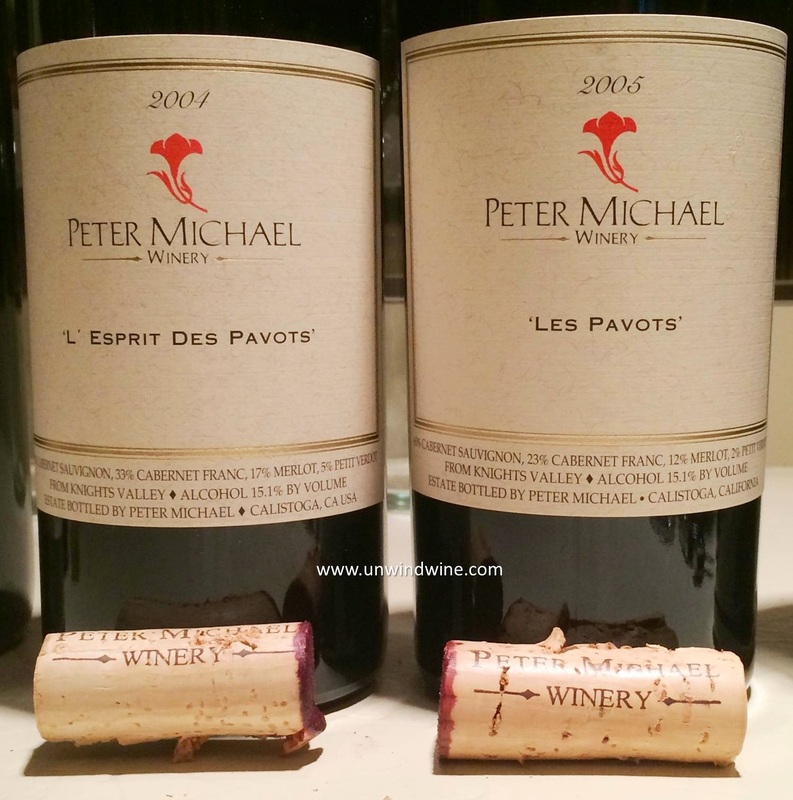 Ernie brought these two Peter Michael selections from his cellar. Les Pavots is an estate bottled Bordeaux blend from the slopes of Mt Helena above the eastern Knights Valley in Sonoma County. Dark ruby colored, elegant and polished, full bodied with full complex concentrated layers of blackberry, black raspberry and blackcurrant with tones of black tea, cigar box and hint of dark mocha and cedar on a silky smooth finish. ’Esprit des Pavots' literally means “The Spirit of the Poppies.” This wine is sourced from the original Les Pavots vineyard blocks recently replanted with the rarest and best clones of Cabernet Sauvignon, Merlot, Cabernet Franc and Petit Verdot. Dark ruby colored, full bodied, bright vibrant expressive full forward concentrated rich berry and plum fruits, smooth and polished despite complexity from hints of mocha, anise and black tea with full tannins on the lingering finish. Dan brought this and the Dominus Estate from his cellar - two napa Valley Bordeaux Blends. This may have been my favorite of the evening although the Les Pavots was a close second. Another huge point scorer with 97 points from Wine Enthusiast, 94 from Robert Parker's Wine Advocate and Wine Spectator. Dark ruby and inky purple color, full bodied, this required about an hour to open and reveal its true charachter and fruits - complex but elegant, balanced and polished, rich deep concentrated notes of blackberries, cassis, with hints of rich, crème caramel, sweet oak and cedar with smooth polished finely integrated tannins on the long finish. While this got a 100 point rating from Robert Parker, the most noted major reviewers, like so many Dominus releases, it may take a decade or more for it to reveal its full potential. While clearly a spectacular wine, at this young age, its a bit closed and tight suppressing its fruits and other nuances. Dark garnet colored, full bodied, firm, dense concentrated complex layers of black fruits, black tea, creosote and anise with hints cedar of spice and dark chocolate with firm tight but well integrated tannins on the finish. Ernie also brought this from his cellar. The '04 is as big and dense as Dead Arm gets but was not as sweet as some vintages. Dark inky black purple color, full bodied, thick, dense, tongue-coating unctuous layer of ripe plum, black raspberry, ripe blueberry and a layer of anise and black cherry with a spicy long firm tannin lingering finish. I acquired this bottle at the legendary British wine merchant Berry Bros. &amp; Rudd at their shop at 3 St James's Street London back in the early eighties. Back then of course you carry it in your hand luggage on the airplane. Single Quinta Vintage Port (SQVP) is a title given to Port wines produced from a single vineyard (quinta) and from in a single vintage. This is regarded by many as the most exciting category of port wine, since it offers the winemaker the opportunity to explore a more terroir-driven approach to fortified winemaking. An emerging style, SQVP started to gain popularity after 1986 when transportation restrictions were raised and smaller estates started to enter the market. Single-quinta, or single-vineyard, vintage Porto is produced only in exceptional years in which a general vintage is not declared. 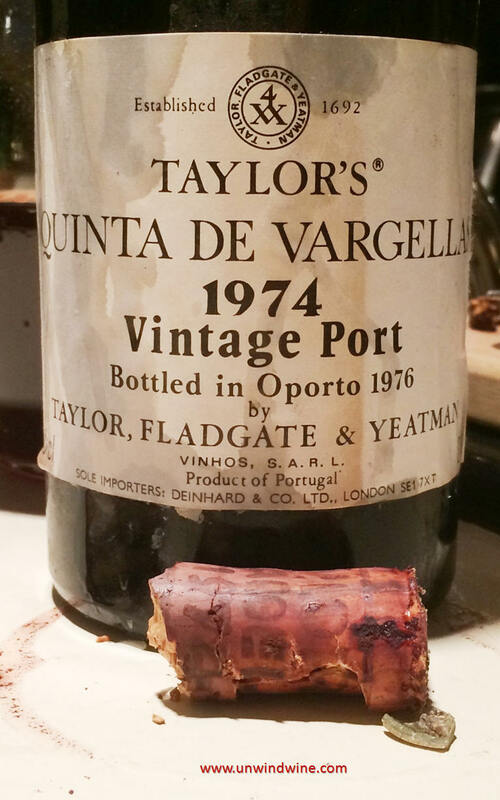 Quinta de Vargellas vineyard has been part of the Taylor Fladgate estate for more than a century. It is known as one of the top 100 vineyards in the world with the highest percentage of old vines of any quinta in the Douro, with 60% over 75 years old. 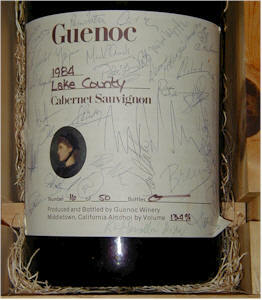 The 1974 vintage was a moderate year that was not declared by the major port houses. Some excellent single harvest colheitas were produced. For the vintage ports, despite a huge crop, very few vintage port-wines were bottled from this year and the bottles are very rare. 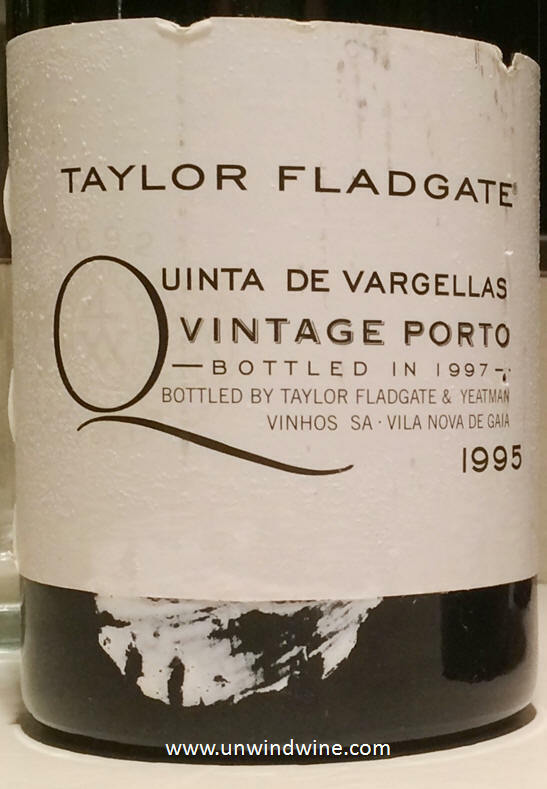 Quinta de Vargellas is the flagship of Taylor Fladgate's declared vintage Portos. In the best undeclared years, Quinta de Vargellas is produced on its own as a single-quinta vintage Porto. While top vintage Vintage Ports often age for several decades, these SQVP's tend to last a decade or two so at forty years of age, this was pushing the limits of its aging window. Furthermore, the bottle and cork showed some signs of seepage although I don't recall ever noticing this in the cellar. Lastly, upon decanting, there was no less than a half a cup of sediment resembling coffee grounds in the bottom of the bottle. This was a bit lean in body and the color was a bit opaque and showed tones of rust color with an orangish hue. It had a big aromatic nose and flavors of intense concentrated black berries, black raspberry, and anise, with tones of cloves, cedar and touch of smoke with a big strong layer of high alcohol. It open immediately and continued to soften throughout the evening. It was drinkable and a tribute to our 1974 anniversary celebration but clearly nearing its end of life. Two nights later this was smooth and nicely balanced and resembled a moderate cognac which we enjoyed with some caramel, chocolate and berries. 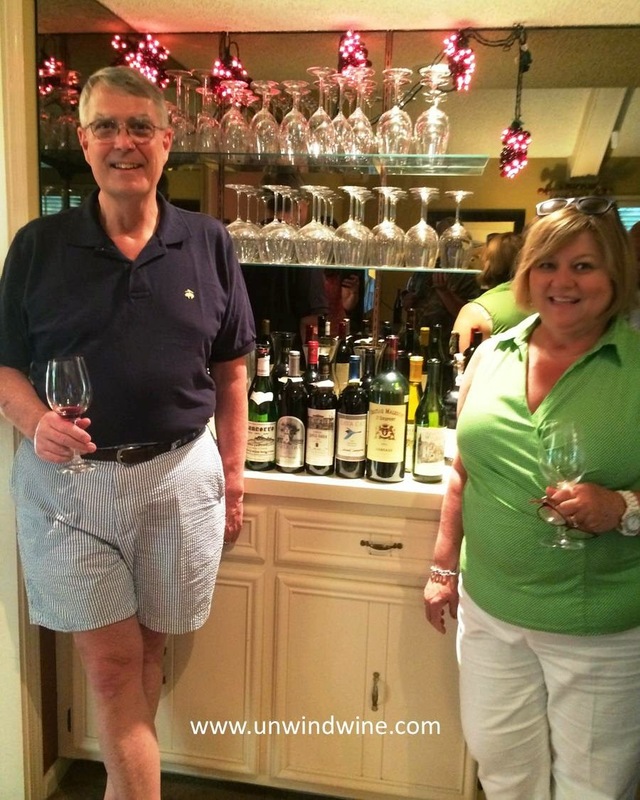 Lyle is a big port enthusiast and he matched my Taylor Fladgate with this vintage selection. Dark ruby colored, medium bodied, intense berry, dried raisins, fig with layers of cedar and anise with a long fruity, alcohol laced finish. The OTBN crew and their wine contributions to the flight are pictured below. The hosts - Bill and Beth. The author/blogger of unwindwine blogspot.